Do you like Angry Birds, Paper toss and other physic based game?? If Yes, then Can Knockdown 3 is the must have game on your Smartphone. Can Knockdown 3 is the part of the popular game Can Knockdown series and third part takes this series to all new heights with its unique puzzles, adrenaline-charged challenges, and even more explosive action. 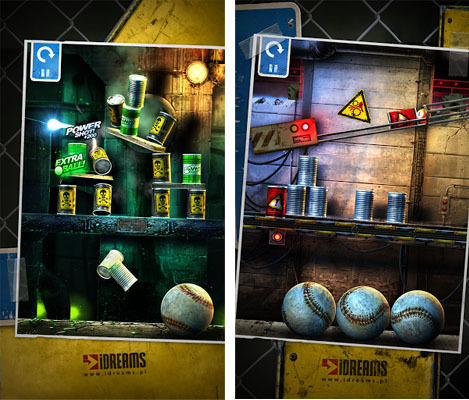 Can Knockdown 3 is the simple game where you’ve to knock down pyramid of cans with baseball. Obstacles, tricks and special moves added to make this game more challenging. In each level, you’ll get three balls and pyramids of cans to knock down. The game is available for free on Play Store, free game comes with 60 levels and ads. To remove ads and remove additional levels, you’ve to pay $0.99 via In-app purchase. But Believe me, the game is worth every penny. The levels are divided into different locations, each location comes with new challenges, new cans and new obstacles. Later levels will challenge your ball-tossing skill and puzzle-solving abilities. The game is loaded with Gorgeous 3D graphics, amazing realism, perfectly-tuned physics engine and easy-to-use controls. Can Knockdown 3 support Google Play achievements and leather board. Show off your skills and challenge your friends! Gameplay boosts like multipliers, bonuses, and so much more! Unlock new levels, open new locations, and discover hidden secrets! The game is available for free on Google Play Stores and it requires Android 4.0 and up.